Rati Saxena (India) is a poet, writer, translator, Editor and vedic scholar, writes in Hindi and English. Presently lives in Trivandrum , Kerala, India. 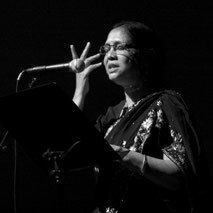 She is also festival Director of kritya International poetry festival for 10 years. Rati Saxena is writing in three directions. she has done research and explores the cultural, philosophical and historical aspects of ancient India through study of Vedas. She has published a number of papers on related subjects. She holds an eminent place in world poetry and writes in Hindi. Apart from these subjects, she writes travelogues and criticism too.